Copyright Petter Bjørstad, 2009-2010, photos also by Tor Erling Bjørstad and Rob Woodall. 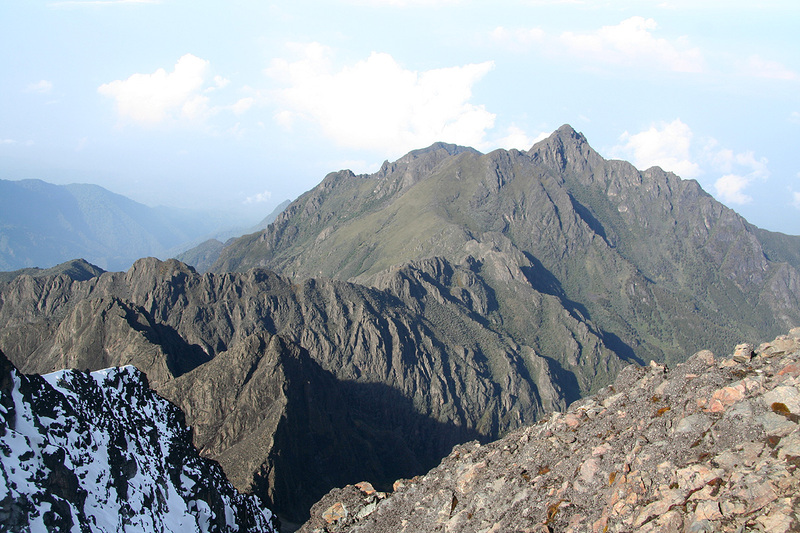 How to get there: This mountain is part of the Rwenzori in western Uganda. See my Trip Report for additional details. 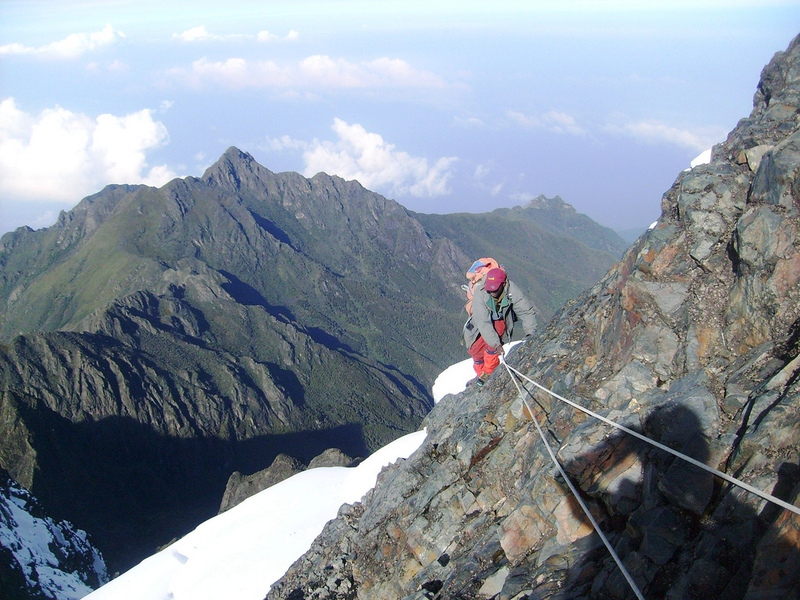 Route description: The route starts at Elena hut, located at 4560 meter with location N00:22.366, E029:52.938. From the hut, descend a short ladder (the way to the outhouse), then continue along a route marked by small cairns. This route runs up the valley, then turns right before the steeper rock wall that can be seen ahead. This part is not steep, but the rock gets quite slippery when wet. Gradually, turning right will lead you to the lower part of a pretty broad gully that runs upwards to the horizon. 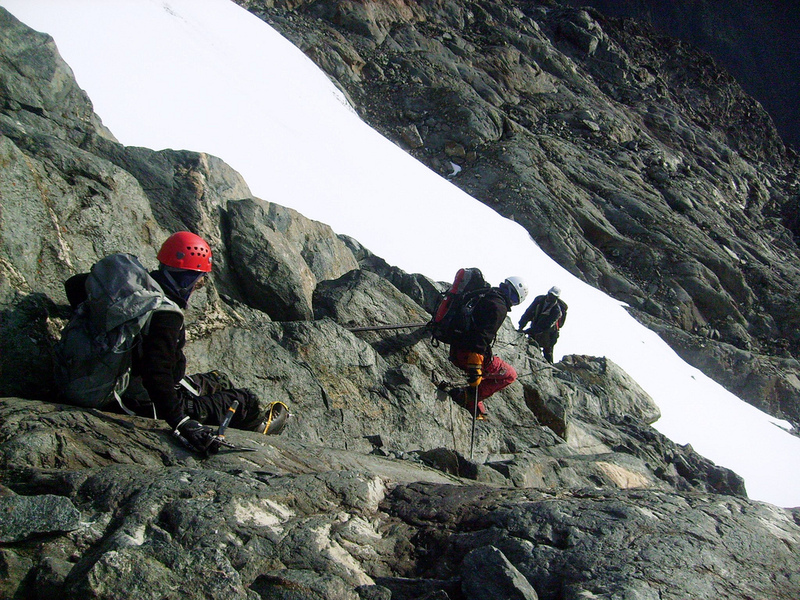 The terrain is steeper, but the climbing is quite easy (YDS class 3). 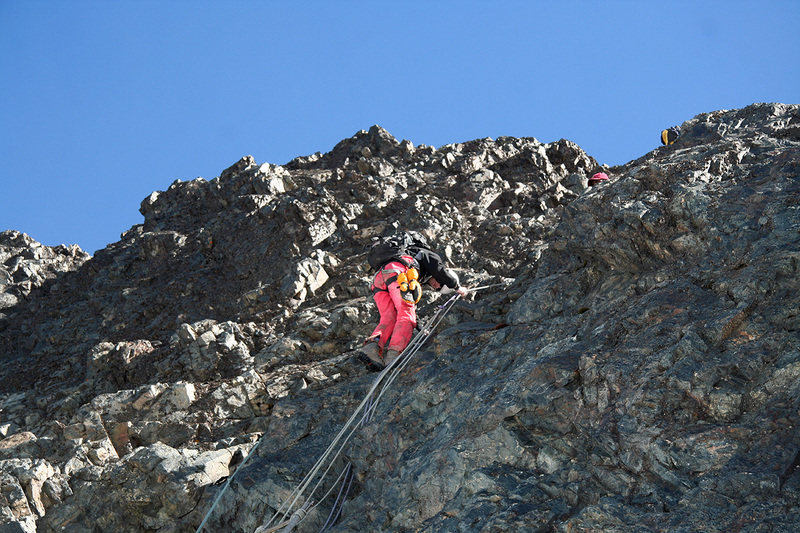 A fixed rope is also coming down the upper part of this passage. As you exit this gully, considerable elevation has already been gained. Follow the cairns as they lead the way (a little up and down between rock) towards a good entry point at the East Stanley Glacier. Crampons are recommended from this point. The glacier is generally very nice, no rope required when we were there. 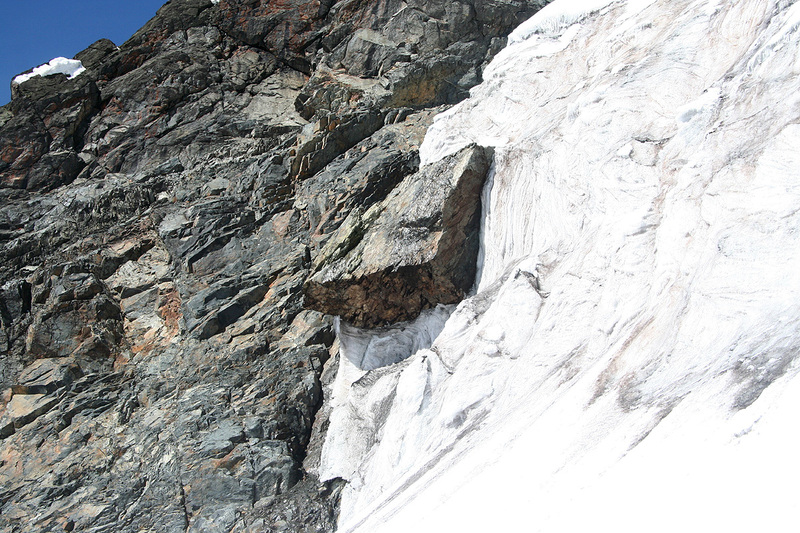 I spotted 3-4 small crevasses, too small to pose any danger. First ascend a few meter to get onto the glacier proper, this is straightforward. The glacier is now quite flat and one can see most of the route ahead. The twin peaks Alexandra and Margherita are straight ahead. 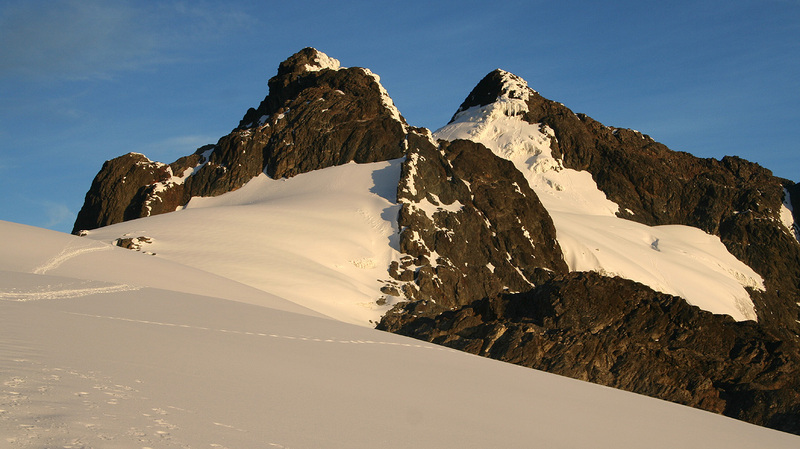 The route stays on the fairly flat glacier as it runs toward Alexandra, then descends and traverses around this peak on her right side. This traverse starts out rather gently as you leave the glacier and follow a couple of smaller gullies down. 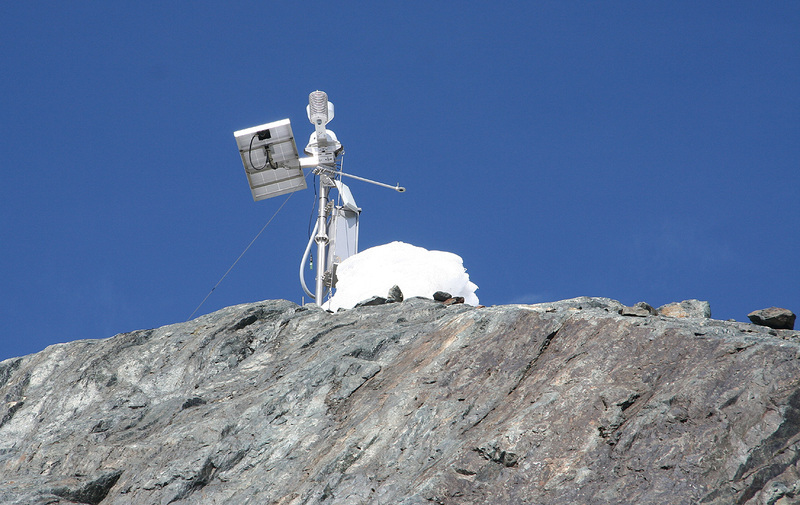 You will pass a small automatic weather station on your left. 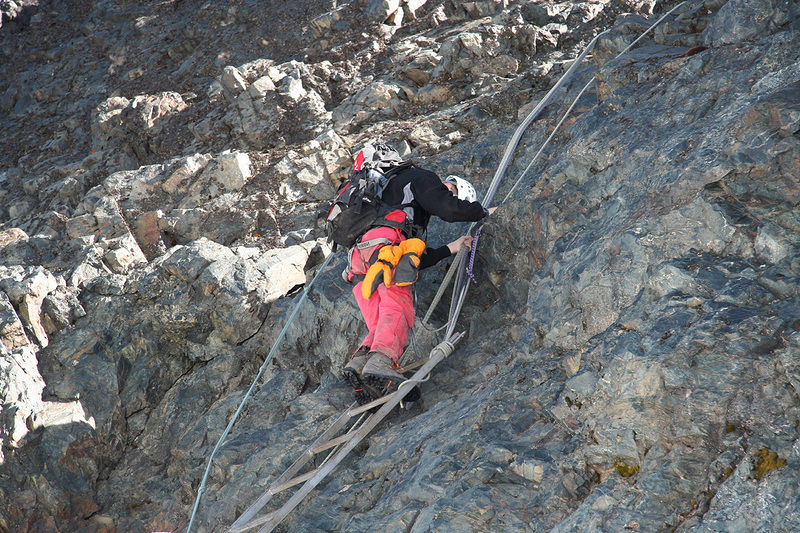 Further down, the rock gets steeper, this passage is protected by a fixed rope that leads to the top of a short ladder. The climbing here is YDS class 3, there are at least two parallel cracks that provide numerous holds. 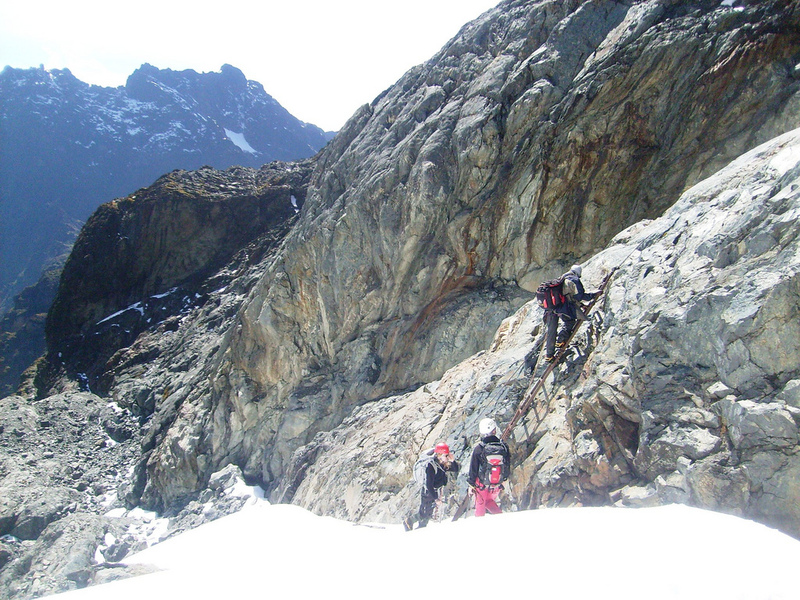 You now access the main Margherita glacier at the foot of this ladder. 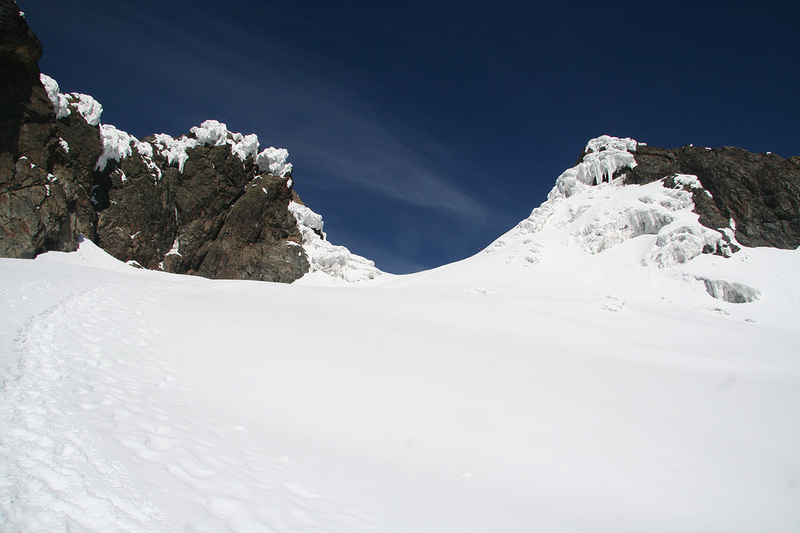 Traverse out to the wider part of the glacier, easy snow, essentially horizontal and well protected. Beware of a huge piece of rock that seems to be stuck in the ice above you. It looks like it will melt out and fall down, hopefully with no witnesses. Ascend the glacier (to your left), the slope is only moderately steep and largely well protected by the glacier formation below. 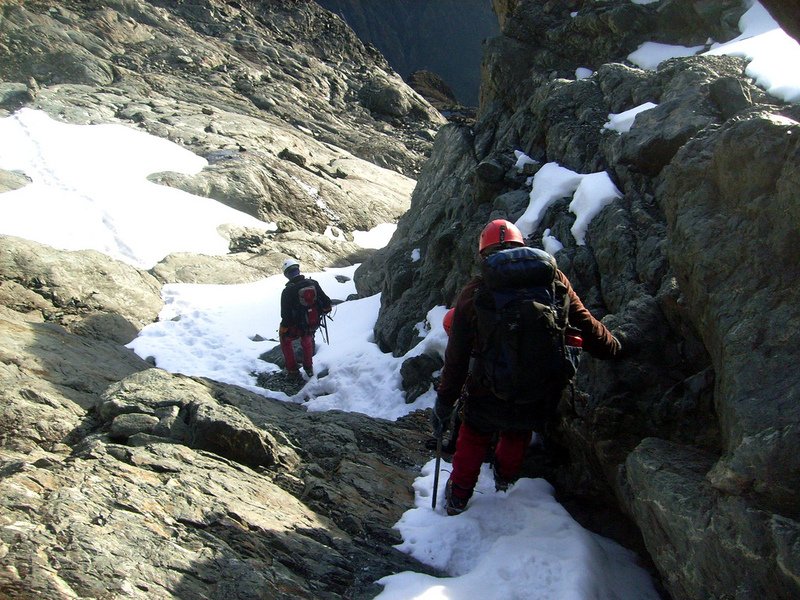 As the slope eases, proceed along the natural route upwards towards the distinct pass between Alexandra and Margherita. 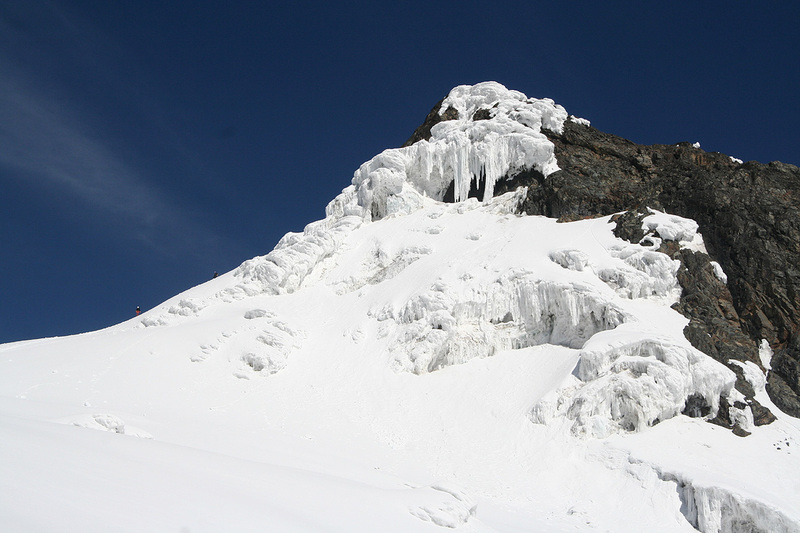 Before reaching this col, head more right and climb the moderate snow that leads up to the final rock of Margherita. 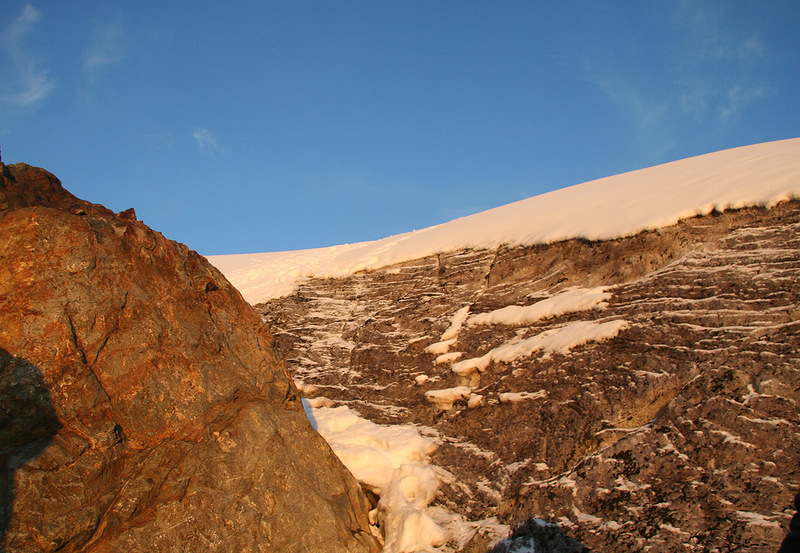 The glacier has melted down considerably and made the last pitch more difficult. This has been compensated by the placement of a fixed ladder. 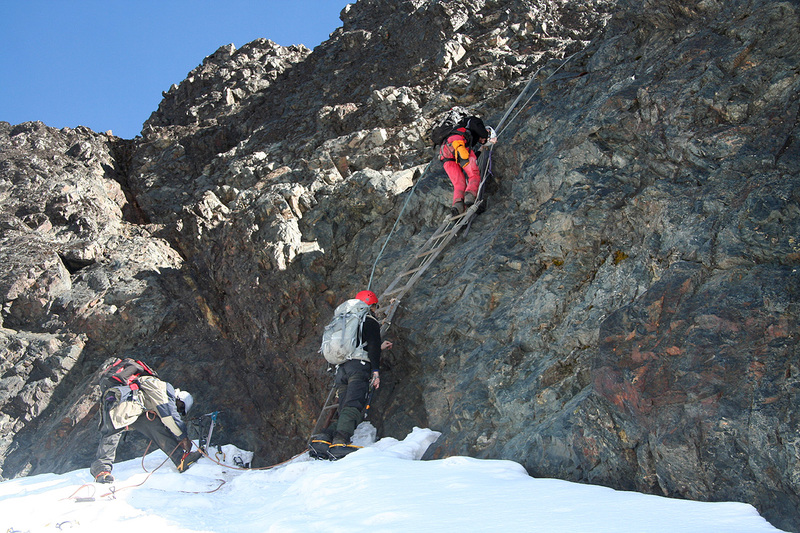 Climb this ladder and continue steeply upwards for about two more meter (YDS class 4). There are fixed ropes on this section. 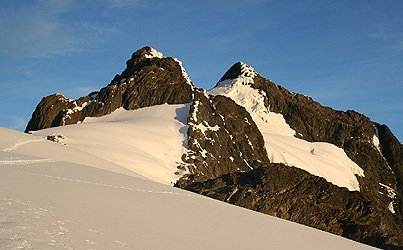 From here, the route traverses right in order to gain the main Margherita ridge. This part is quite easy, also protected by fixed ropes. The easiest way to climb this section without the ladder/ropes is likely to start out a bit left of the ladder, climb along cracks and then contour more right above the ladder to connect with the final traverse. 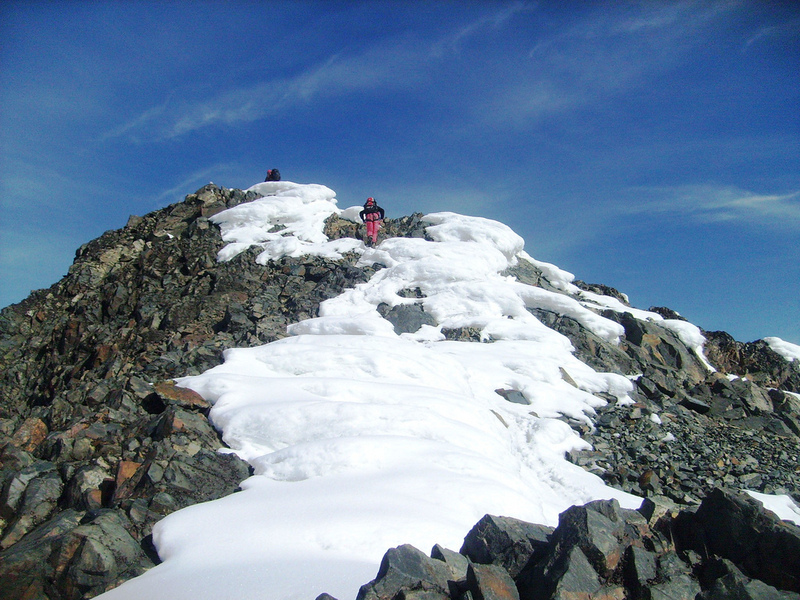 As you reach the main ridge, turn left and ascend to the summit. This section is (YDS) class 2. 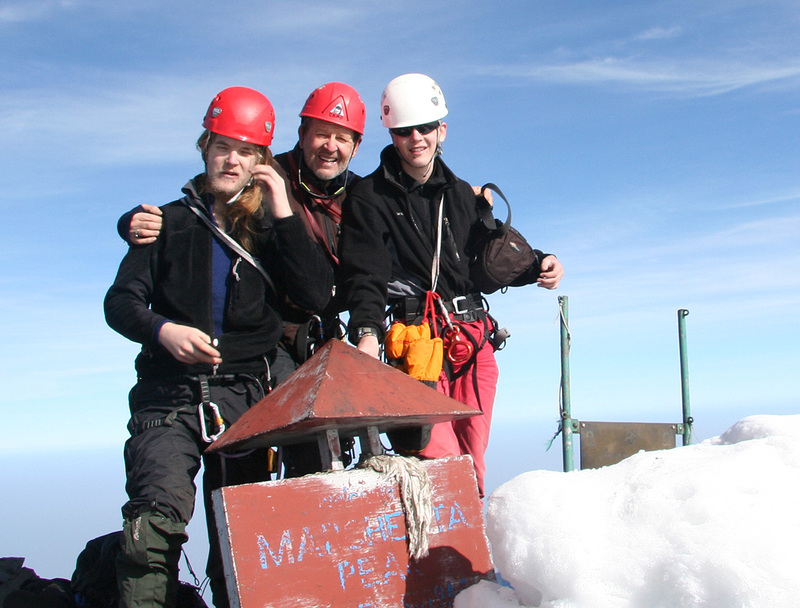 Comments: I climbed this peak with my two sons Tor Erling and Pål Jørgen. My friend Rob Woodall completed the party. 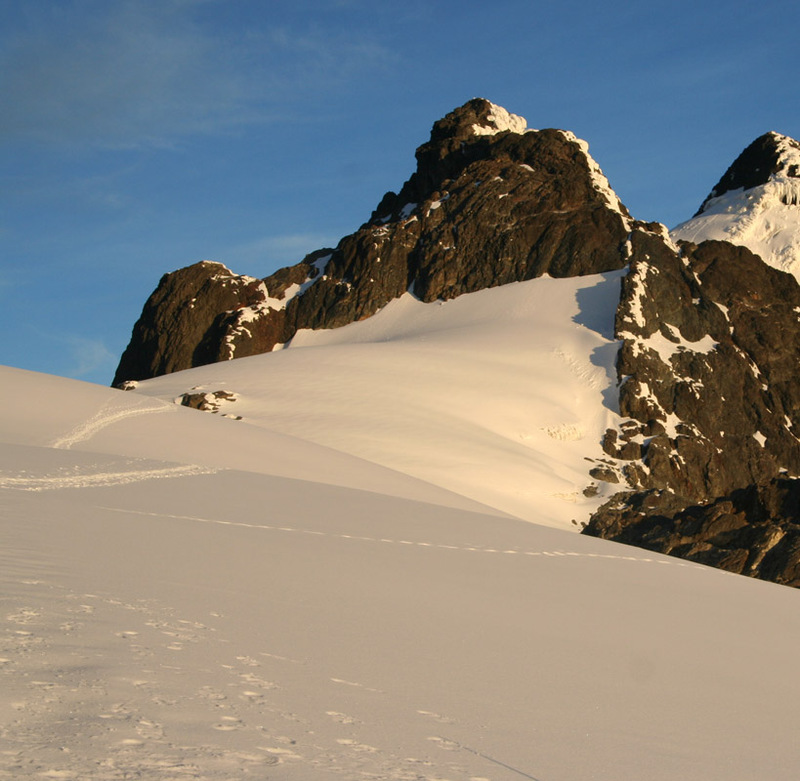 We started from Elena hut at 0605 and experienced a nice sunrise while traversing the flat section of rocks just before the glacier. 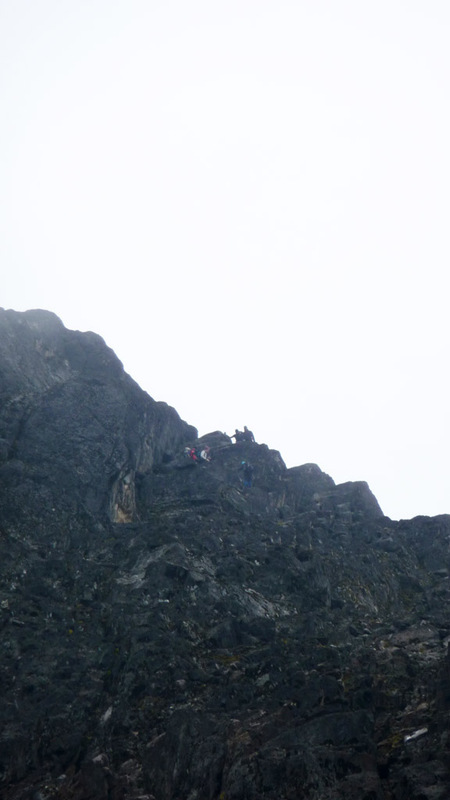 We had a couple of short breaks in the nice morning before reaching the summit at 0920. 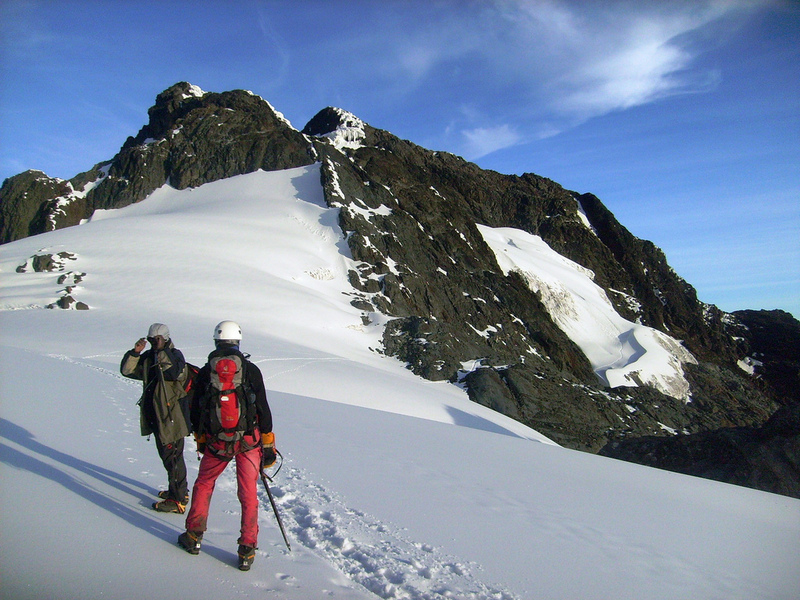 Gorgeous weather, we walked a bit along the ridge into Congo (towards the small subsidiary spur named Albert), as well as staying busy with photography. 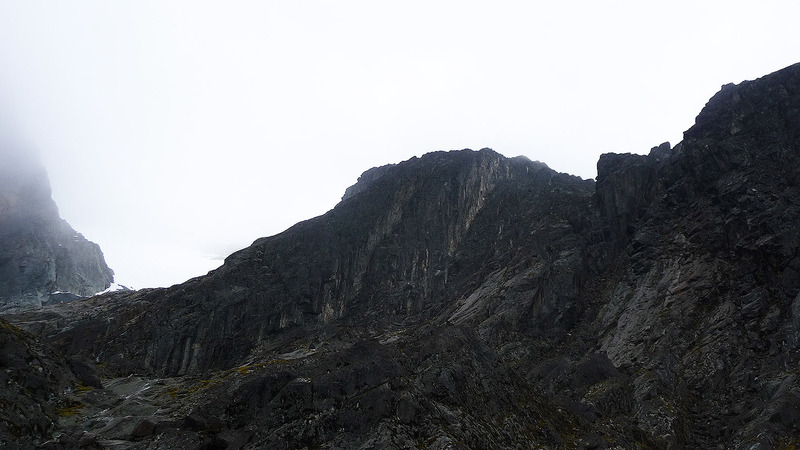 We started our descent around 0945 and had an easy way back down to Elena, arriving there at 1140. 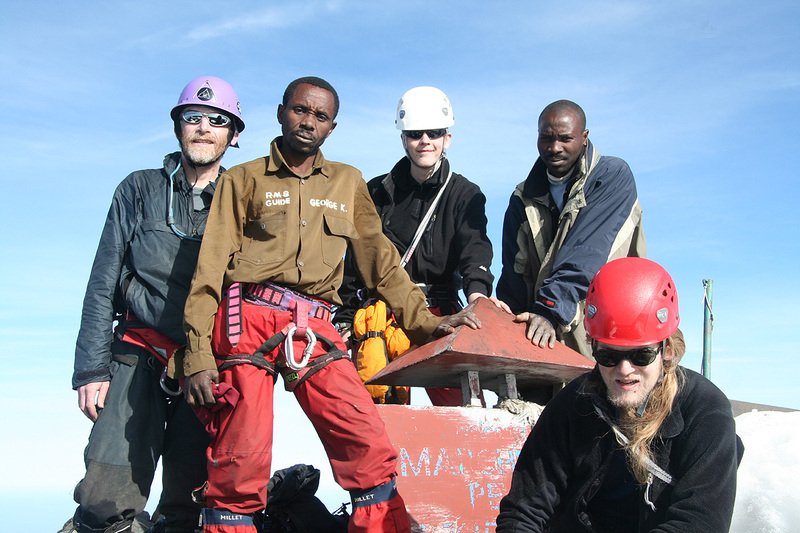 Thanks are also due to our two local guides George Kurt and Kule Sebestian from the Rwenzori Mountaineering Service. Me, Tor and Pål on top of Uganda/Congo. 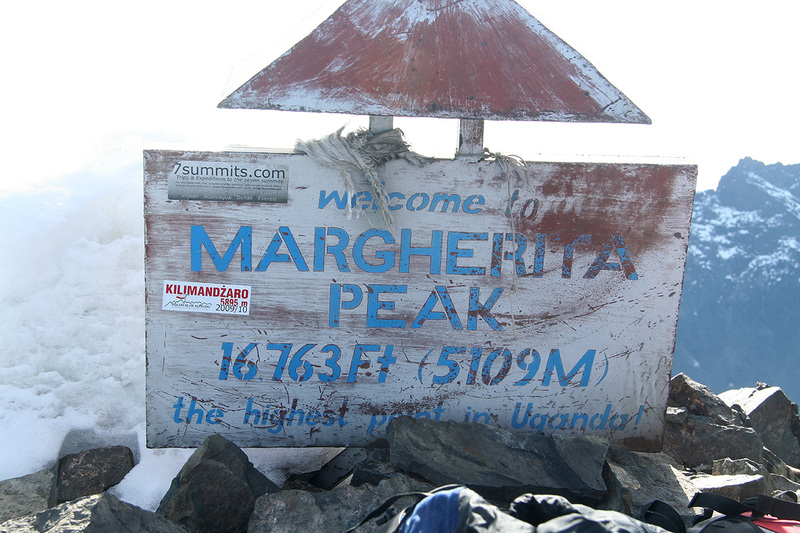 The team at the Margherita summit.